Ask Hubby began at the New Year on Coupons, Deals and More. 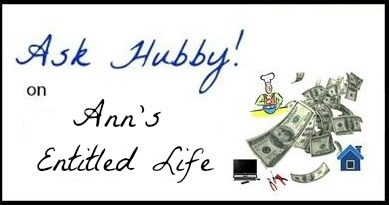 I wanted to bring it back on Ann’s Entitled Life because, truthfully, my Hubby has a lot of knowledge and great advice. One of my 2013 New Year’s Resolutions! was to come up with new weekly series. I am still thinking, but hubby actually came up with this idea! Because hubby is so multi-talented and an expert in so many fields including, but not limited to: cooking, computers, finance, real estate, home renovation and maintenance but most importantly; relationships. He has graciously agreed to share his infinite wisdom with the readers of Coupons, Deals and More Ann’s Entitled Life. On a limited, trial basis, hubby has agreed to answer your questions (the trial assumes he receives any questions, the limited basis is a weekly series). And, since I want him to do this series, I agreed to write that crap he dictated above. You can submit them by emailing here and make the subject title “Ask Hubby”. Note: if you do not want your real name used, just say so in the email and he will respond “to a reader”. Some real notes about my hubby: He’s a great guy who thinks he is funny (see above). He went to undergraduate school for Hotel and Restaurant management, but, since he decided he liked money, switched his concentration to hotel real estate. He got his MBA from a top U.S. business school. He was one of those “Evil Wall Street Bankers” for over 10 years before moving west to marry me. He was a partner in a very successful real estate company for six years before being fortunate enough to retire in his early 40s. In other words, he isn’t a finance schlump although some areas of his expertise are better than others. I would be careful with the home renovation questions though. Sure he has rentals he has rehabbed, but Bob Vila he is not. I have often asked him why he never got a job repairing computers. He said, that it is fun, but if he had to do it for a living it is less fun. He’s so good, I have abdicated all computer repairs and responsibilities to him… and I like it (said the former computer programer). So, if you have any questions for my hubby make sure you Email Ask Hubby questions here! I have a question about finances and IRAs. I recently retired from city government and I am now making more retired than I was working. But I couldn’t sit at home and my CPA told me that he would figure out how much more taxes I had to have taken out of my checks, which I did. When he figured this out, he said I fell into a new tax bracket and if I wanted to work a part time job, up to 20 hours a week that would be fine, as long as I put the money into an IRA. I want to know which IRAs are best. I want one that I can take the money out of and not pay a penalty, if there is such a thing and one that you can put a certain amount in, such as my part time pay check which is not a lot. Is there a minimum and maximum amount that a person over 50 can put in to an IRA? Can you have multiple IRAs? I am going to start traveling again and I would use that money for the payment of the trips I want to take. My new part time job does have a 401k plan but it is my understanding that you can not take the money out of it until you retire. Would it still be wise to put some money into the 401k, because they match a certain amount but I am not sure how much yet. Can you please advise me on what would be the best way for me to go. Understand that I am investment stupid so you will have to talk down to my level when explaining. I don’t understand the difference between a bond and a stock, so that should tell you something. I sent your question along to Hubby, Candie. Can you ASK HUBBY how I can just BE CANDIE…. sounds like a pretty GREAT position to be in!!! !